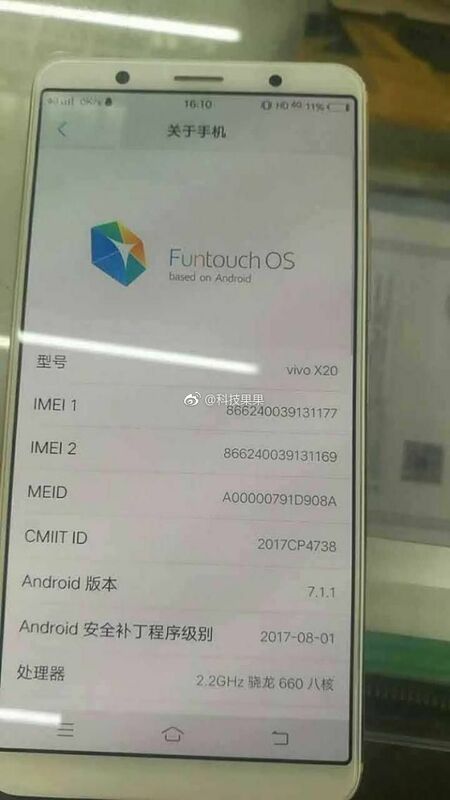 The Vivo X20 has been the subject of numerous leaks in the past few weeks. The device was speculated to be launched as the Vivo V7 internationally, with the X20 Plus corresponding to the V7+ (first impressions), which was launched in India just yesterday. However, according to the latest leaked image of the Vivo X20, the devices might not be as similar as we thought. The image, which was posted on Weibo, pictures the X20 displaying the ‘About Phone’ section. It reveals that the device will run Android 7.1.1 (the V7+ runs 7.1.2). It also says that the phone will be powered by a Snapdragon 660 processor clocked at 2.4GHz. In comparison, the Vivo V7+ features a Snapdragon 450 chipset, and is one of the first devices to do so. The image also confirms earlier leaks about the device sporting a nearly bezel-less design. The Vivo X20 will reportedly feature a 5.2-inch full HD display, 24MP selfie camera, 3,500mAh battery, 6GB of RAM and a rear-mounted fingerprint sensor. It is expected to be launched in China in the coming weeks.